"Some unknown hand carved on the cab's woodwork the names of all the men who had met death there, with the list and dates of her wrecks...One day she ran away from the Ogden Yard, while Tom Flynn was at the throttle, with his brother firing. The story is told that Tom lost his mind from staring at the death roll carved on the cab, fought savagely with his brother, tossed him out of the cab to die of internal injuries, and then was found, a raving maniac, pinned beneath his overturned engine!" Sometimes the evidence supporting that an engine was hoodoo could be quite direct. Consider the account of the Pennsylvania Railroad 1313, recounted in the book Forgotten Pennsylvania. Crewman believed the engine to be unlucky from the start on account of its number--railroad men on many roads seemed to consider locomotives whose designation included then numeral 13 or was composed of numerals of seven or nine to be ill-fated--and the locomotive soon began to live up to its reputation. Shortly after entering service, it killed two children who had wandered onto the tracks, and then a few months later fell off a bridge during a wreck. More than a dozen crewmen and passengers perished. A New London, Connecticut news paper issued in 1913 describes a Hoodoo Engine. 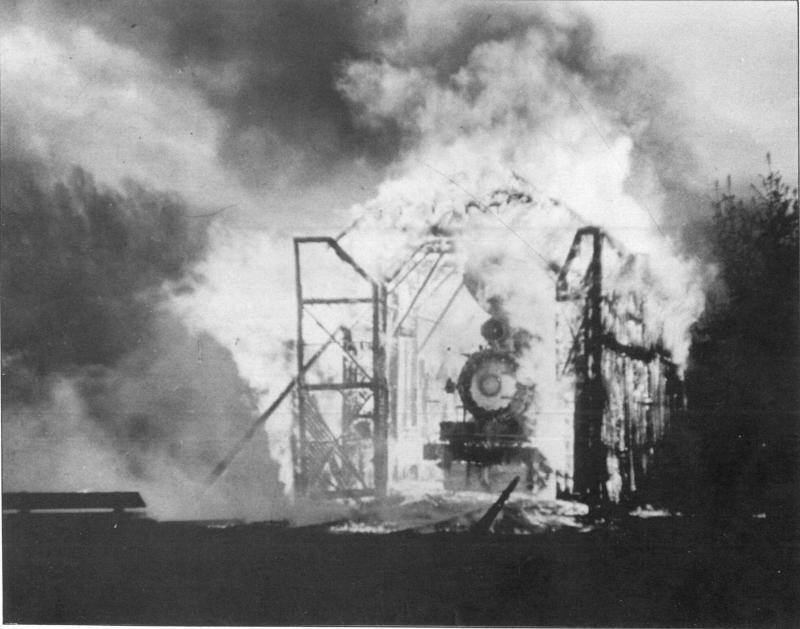 One month after 1313 was repaired and put back into service, the locomotive collided with another train. Crews reported that the brakes failed to activate, but no fault could be found with the system while repairs were being carried out. Only weeks after returning to the rails, the 1313 was involved in a far more serious incident: The boiler exploded as the crews took a train up a mountain. Crews were thoroughly suspicious of the locomotive by this point, but it returned to service with predictable results: 1313 once again hit another train, and then a fireman suffered serious injury when one of the oil cans inside of the cab exploded. 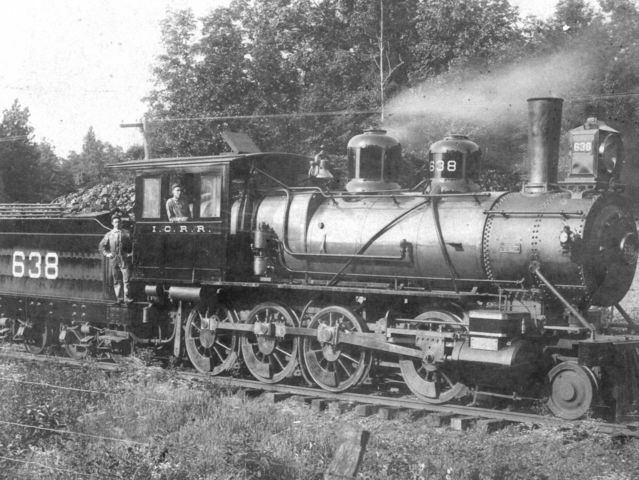 By 1890, crews assigned to the 1313 flatly refused assignments to the locomotive. If Forgotten Pennsylvania is to be believed, 1313 took almost 30 people to their graves. Locomotives average around 25 to 40 year lifespans, and it isn’t out of the ordinary to expect that every one of them will be involved in some sort of fatality incident during their service years, particularly if they operated before the implementation of air breaks and automatic couplers. 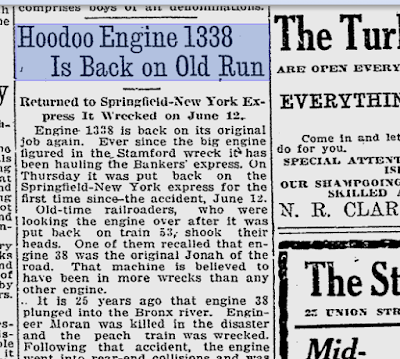 Engines like the 1313 seem to have been bestowed their status as Hoodoo Engines because they amassed a higher number of deaths and mishaps than average. Some of them, though, earned the name because they seemed to have a laser-guided sense of vengeance. 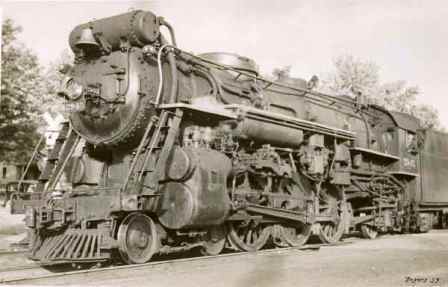 # 638 survived the wreck that killed Casey Jones and went on to claim several more lives in wrecks . By the time it was sold to Mexico, it was regarded as an ill-tempered engine. In his well-docmented book Transforming the Appalachian Countryside, Ronald L. Lewis relays the story of a locomotive owned by Babcock & Boom Lumber Company. Number 4 came to the company under suspicious circumstances--it already had such a reputation that one of its former owners, the Lehigh Valley Lumber Company, had to sell it because crews refused to take the engine out of the yard. The 4 had a well-established habit of wrecking itself in rivers, but achieved its greatest trick in 1924 when Fredrick Viering, Babcock’s superintendent at the time, rode in the cab during an inspection tour. After the train began to run late, Viering commanded the crew to move the train faster than what was advised for the poor weather conditions; some of them later related to historians that “I’ll eat my supper with [my wife] tonight or I’ll eat it with the Devil in hell!" It was entirely predictable which two options given in the ultimatum would come true. The 4 flew off the tracks as it approached a sharp curve. Superintendent Viering was thrown into the mud and killed when the locomotive landed on top of him and pierced his skull with the sanding valve lever. Few other tales of Hoodoo Engines are as blatant in describing a locomotive that appeared to take personal revenge on a specific person. Railroad companies, for their part, admitted that superstitions about locomotives’ temperaments were widespread, but took a more prosaic view of the cause of their discontent. They ascribed frequent accidents to shoddy maintenence, or mechanical faults that went undetected during routine maintenance. Both problems could certainly have contributed to a locomotive experiencing problems, but in either case, one would expect the same flaws to show up in other locomotives in the same class or serving out of the same location. The simple fact that railroading was (and is) a dangerous occupation, particularly before the invention of air brakes and automatic couplers, it might be natural to feel that the equipment had some vendetta against human life. It would not sit well with any rational human to know that the last man who pulled the throttle or worked the firing valve lost his life in that same cab. Perhaps the crewmen found it more palatable to believe that there was some sort of intention behind each death or injury, even an evil one, instead of accepting that most of the occurred for no reason other than pure bad luck. All that is an attempt to put a psychological explanation on the phenomena. 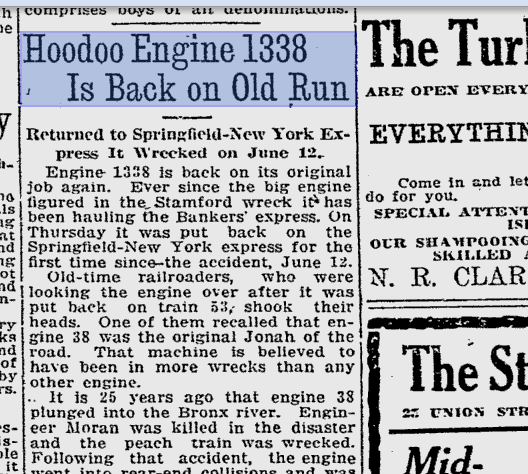 There's a part of me, though--and not a sentimental part--that wants to conclude that the superstition of Hoodoo Engines and what we read in the historical records is just an honest recollection of railroad crews describing what they observed with their own two eyes. One of the biggest surprised that I had as I engaged more closely with the tourist railroad industry is just how deep-seated the assumption that steam locomotives contain a will of their own still is. Erie Railroad #2917 was reported to be Hoodoo; the company eventually obliged the employee's suspicions and renumbered the locomotive as 2945. I entered into the railroad preservation world thinking that the mechanics and crews would have the experience and mechanical knowledge to lay the myth to rest, especially in the era where evidence must be given to support any claim. Quite the opposite turned out to be true. Crews were forthcoming about describing things that a locomotive needed or liked and disliked, spoke it words of encouragement or expressed disappointment that it had failed to give its best performance. I have had my own experiences of feeling a presence from a locomotives--similar to that feeling that you get when you know someone has walked up behind you, even if you don't see them--and I've noted that the feeling differs from engine to engine. I can accept that the only reality behind this is that my imagination is running a bit wild, but I can also easily imagine how other people more predisposed towards superstitions and spirituality might interpret that feeling differently. I don’t think it’s insignificant that the Hoodoo Engine mythology seems to have died out along with steam--I haven’t run across any tales of electric or diesel locomotives feeling malevolent, though I suppose they’re out there. Chalk that up to the nature of steam locomotives themselves: No matter what it burns or how much tractive effort it puts out, it takes a bit of coaxing before any of them will perform.